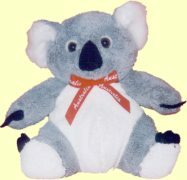 Koala Gift Shop presents collection of Australian koala bear themed gift items for koala's fans around the world. The koala is a charming native Australian animal. 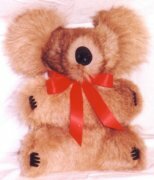 With its handsome face and 'cuddly' appearance it looks like a toy or a baby bear. In fact, wombat is koala's closest relative. 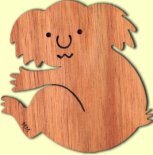 Koala and Kangaroo wooden Christmas decoration set is cut from highest quality Australian timber and will give a festive Australian touch to any Christmas tree. Consists of 2 animals with red ribbons, presented in a small, light, clear packet. Each beautifully boxed set of six coasters is cut from highest quality Australian timber. Each set includes two timber fridge magnets in a clear packet cut from highest quality Australian timber. 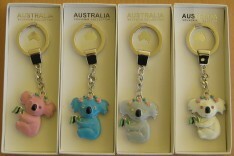 Great colorful metal koala key chains. Metal cast koala figurine with enamel front finish. Available in four colors as shown. If color is important, please don't forget to specify it. Temporary out of stock, sorry.